588 / Rainbows up close. It was the coolest thing when I saw it was raining & the sun was out. I ran to the door & threw it open knowing I'd see a rainbow & was totally taken back when I saw the rainbow IN MY FRONT YARD! I screamed at Ricky to come see it & he was amazed too. He ran to get his shirt on & wanted to run through it. The pictures dont do it justice. Its kind of hard to make out - but it was there, trust me. So cool! That time of year again where I can put the screens in the window & give the AC a break. My allergies on the other hand get flared up, but its a trade off I'll do because I love fresh air. 592 / Just glad to be home. Last Friday, what was left from Harvey (the hurricane - not my dog) came dumping on us & it was AWFULLLL. Rain all day long, with puddles covering your feet, & COLD air. I had ran to the grocery after work & was soaked to the bone & chilled. I just never was so happy to get home in my own house & put on warm fluffy socks & sit on the couch & watch the rain from my porch. 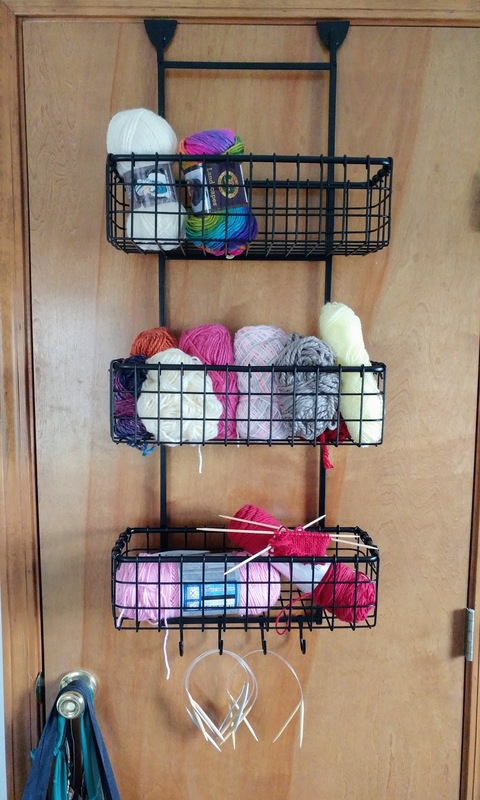 593 / New Yarn holder. 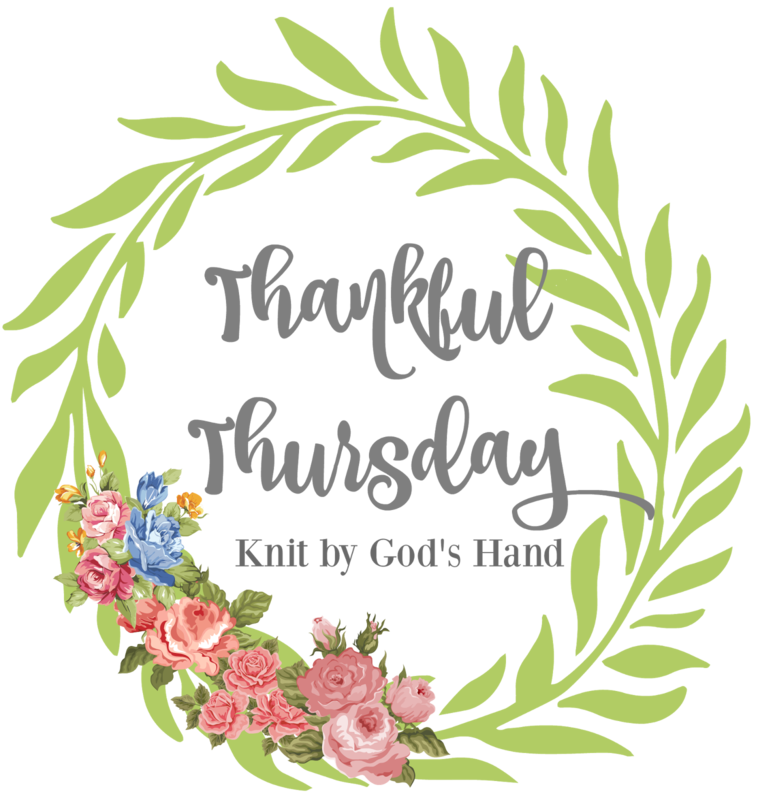 I actually bought this to use in my kitchen, but it doesnt fit over doors that go outside - so I put it on my closet door in my room & its perfect to hold my leftover yarn from projects. I would love another one for my bathroom now too. Got it at Sams Club for 19.99. Bargain. 594 / Finally figured it out. 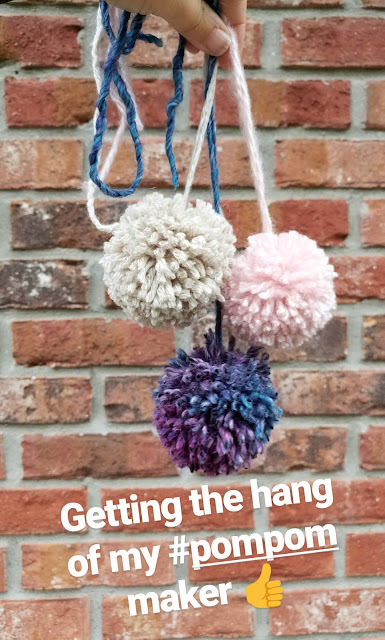 I got some pom-pom makers a few weeks ago & every time I would try& make one, they'd fall apart. I couldnt get the middle tight enough to hold it together. I looked up some tips & someone suggested using dental floss. It's made all the difference. I'm on a pom-pom kick now. I honestly dont know the last Sunday I was home - other than being sick - so home 'just because' - & I dont know when it will happen again. So I'll totally mark this as a thankful day in my books. 598 / Day off work. 600 / Found a bag of Bruno's dog food. MY GOODNESS... I cant tell you the hassle its been to find this dog food for Bruno. This was the only food that really seemed to clear up his skin. Do you know we havent found it since we used it a few months ago. & then we ran across it this weekend & GRABBED IT UP SO FAST! It was even on sale. Only 1 bag. You cant find it online either. It always says "Out of stock" or "Unavailable"...what's in this stuff? Magical fairy dust???? Anyone ever see this out, LET ME KNOW. 601 / HOUSE PAID OFF!!!!! OK. This is the best of all.... we started off our month by being true home owners. Ricky went & made the final payment on our house this weekend. It feels so funny not having a mortgage. I feel like Dave Ramsey would be proud. What good things have happened in your world lately? Oh wow - awesome on being mortgage-free!! I'd totally call up Dave Ramsey just to let him know. :) I have to avoid going into stores, mainly because of their clearance shelves and because Dave Ramsey would then shake his head at me again. I am LOVING this weather! Cool nights and warmish days are my idea of heaven. Wow - amazing to make that last house payment! We've always rented, and now we're old, so I don't think we'll ever experience that. Now if we could pay off Mike's student loans THAT would be a happy day! I started a crochet project this week with some discontinued yarn that someone sent me & I had to finagle, and crochet the last row extra tight, (and use the same color in a different kind of yarn), but I finished the project. I was sweating it! WOOHOOO!!!! So happy that you fully own your home; I know that there is probably such a feeling of freedom there. Also, I'm glad you found the right dog food for Bruno; that's a huge blessing! I love your yarn holder; it's always fun to find new ways to organize! Congrats on being TRUE home owners! That's so fantastic and must feel awesome! I love the rainbow in your front yard and that Ricky wanted to (did he do it?) run through it. LOL! I love it when I find a surprise, good sale. Those are the very best kind! Congrats on paying off your house! That is amazing! We're about 2 years out, and I can't wait! It's so fun watching the numbers go way down, so now what are you going to do with all that extra money?! The rainbow thing was so super cool! No mortgage!!!! That is amazing!!! I feel like we are going to be digging in a deeper hole once we move and get a bigger house and it will never be paid off lol. The rainbow is so cool!!! Where is the gold??? Are you hiding it and not telling us? LOL Yay for clearance yarn :) Your pom poms look so cute. 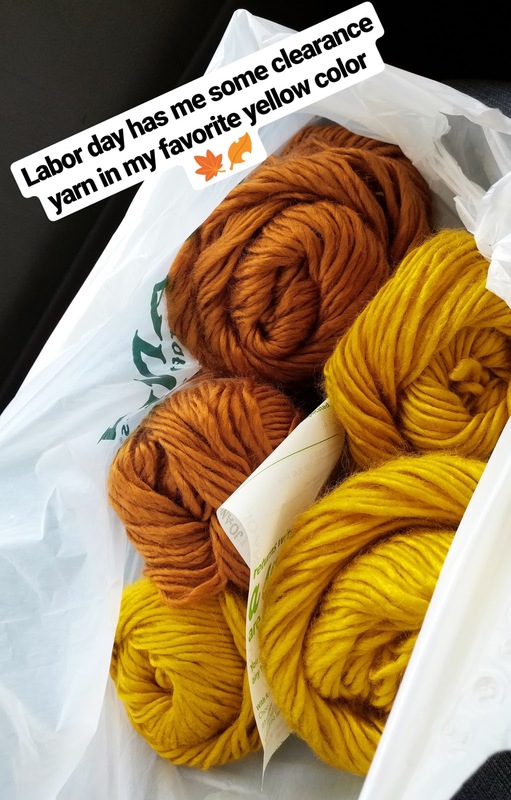 Love the colors of your sale yarn. Can't wait to see what you do with it. I'll try to add a post and link up when I get home this evening. WOO HOO on paying off your house! That's a dream come true for me---we're working to pay ours off early too, courtesy of motivation from Dave Ramsey :) That's got to be such a good feeling! Girl that is amazing and definitely worth celebrating! Congrats on owning your home!!! Seriously, you paid off your house?! That's a huge accomplishment! Congratulations!! We're working on becoming debt free... it's a process! Our daughter had a Westie and finding food that wouldn't add to her skin allergies and ear infections and eye issues was quite a chore. Our daughter eventually just cooked all her food at home. We absolutely adored Sugar but will never have a Westie again. That poor dog went through so much. Hope your boy is doing well! YAYYY!!! Way to go with paying off your house!!! That's so amazing! Congratulations! 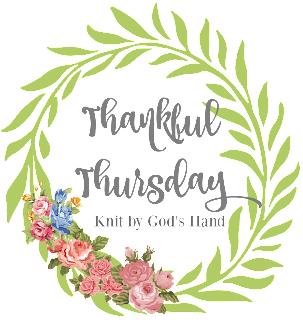 I love those yarn colors! And what a neat rack to hold it all. Congratulations on the house! What a relief, I'm sure. Congrats on that last mortgage payment! That's amazing! 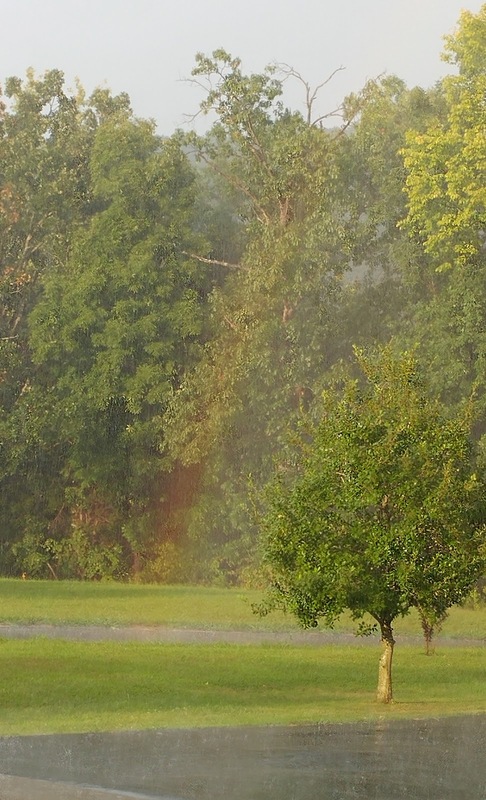 And how cool that the rainbow was in your yard! My AC has been off for about 2.5wks now which is amazing. The windows have been open and I love all the fresh air in my house! I bet paying off the house feels AMAZING! I can't wait to be there! Also, they only seem to have the 4LB bags - and they seem pricey? But IDK what you're paying. Amazon has them here...at least it looks like the same stuff from your pic.